Your home may not seem like an accident waiting to happen, but to a curious pet, dangers can be lurking around every corner. The 10 tips below are provided to alert you to common household dangers to pets, and how to avoid them. Keep all medications in closed cabinets out of your dog’s reach. Even over-the-counter medications can be harmful – one regular-strength ibuprofen can cause stomach ulcers in a small dog, and several pills can cause kidney or liver failure. Common medications such as anti-depressants, diet pills, pain killers, and cold medicines could be potentially fatal if ingested. Never medicate your pet without your veterinarian’s approval. Houseplants should be kept up high, or in rooms where your pets are not allowed – many can be toxic to dogs. Do some research on the types of plants you have, even in your yard, that may be toxic, and take steps to prevent your pet from eating them. Azaleas, oleanders, mistletoe, Easter lilies, and certain types of palms can be fatal if ingested. Keep pets away from cleaning supplies and assume all are poisons. Some might simply cause an upset stomach, but others can be fatal or cause severe burns of the tongue, mouth areas, esophagus and stomach. 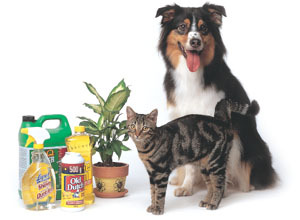 Keep all insecticides and pest control products, such as baited rat, ant, snail or roach traps, away from your pet. Whenever possible, avoid using these poisons, as pets can eat a poisoned animal or insect, even if the trap is not placed in your pet’s typical whereabouts. Be aware of dangers in the garage and carport and keep auto products stored in areas away from pets. Antifreeze is a particular danger, as pets are allured by its sweet taste, but less than one tablespoon can be fatal for small pets. Keep your pet off the grass when you are treating the yard with any insecticide, herbicide or fertilizer. Make sure the grass and scrubs are completely dry before your pet is allowed back into the area and do not use these products until you have talked with the manufacturer or your veterinarian about their safety in pet areas. Always store them in an area out of your pet’s reach. 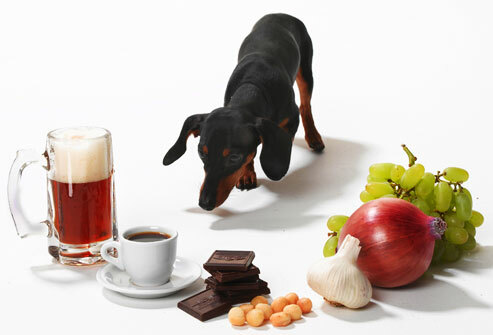 Here is a list of many common items that may be dangerous to pets: batteries, cigarettes, coffee grounds, alcoholic drinks, mothballs, pennies (contain high levels of zinc), potpourri products, fabric softener sheets, automatic dishwasher detergents (cationic detergent ingredients can cause corrosive lesions), and packaged warmers such as hand or foot warmers, which can contain large quantities of iron. Chocolate and most leftovers are a big no-no for pets! One-half ounce or less of baking chocolate per pound of body weight can be toxic, and even small amounts can cause pancreatic problems. Meat scraps that contain cooked fat can also cause pancreatitis. If you give your dog cooked meat, boil it and trim off all the fat. Never give meat products such as country ham to your dog. Get your veterinarian’s approval for any flea and tick products before using them. If using a household fogger or house spray, follow instructions carefully, and remove your pet out from the house, allotting the proper amount of time before returning. If you have any uncertainty about a product’s safety for your particular pet, call the manufacturer or your veterinarian before use. Secure a national pet poison control hotline number from your vet and post it on your refrigerator. This number can be invaluable if your pet ingests something after-hours. And don’t forget: Prevention is always the best cure. You can find more information on poison-proofing your home on the Pets Matter blog by the American Animal Hospital Association. 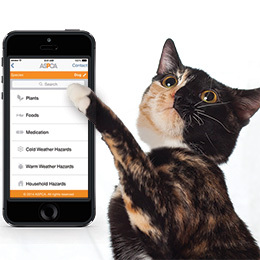 The ASPCA Animal Poison Control Center (APCC) free mobile app provides a wealth of knowledge in the palm of your hand, quick access to potentially life-saving information, and their hotline 24/7/365.